Five years ago, when the ceramics shops started closing in our town, I knew I had to have another hobby to be able to ease into intelligently. Working with fabrics was nothing new to me, as I had sewn quite a bit during high school and college. So off to the fabric shop I went and decided that my favorite color would be the basis for the new quilt. Hues of blues became my favaorite quilt and will be till I'm carried off to heaven in it. Mom painstakingly helpe me sash and bind this first quilt, then said, Rich, you are on your own for the next one. 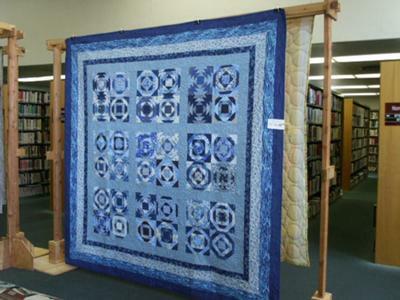 Quilting is a life long journey, an art form and a way of expressing oneself artistically. It does not bother me, that being a man and a quilter can go hand in hand and provide so much enjoyment as a hobby. My son is in love with this quilt. Did you make this pattern or adapt it from another one? He is very impressed that it was made by a guy! I keep trying to get him involved in quilting, but with no success. I am an artist, involved in drawing, ceramics and fiber arts... now its quilting. My favorite color is RED... makes me happy. As for you being a guy quilter... GREAT! I think your quilts will reflect your personality. My husband often comments on my works... he compliments my strong areas- color, design and the originality. He 'sees' differently>>> and explains to people... "Did you know she used 598 fabrics in that quilt." or "All your snail trail blocks are off, rotated by 10%. At least you are consistent." Your quilt is inspiring... I will be making a blue quilt soon--- very calming.